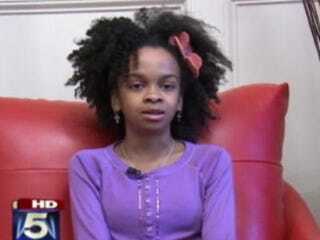 An 11-year-old Atlanta girl has become a worldwide success with her clothing line, according to My Fox Atlanta. Maya Penn has more than enough work to do with school, but the seventh-grader also spends half her time in a studio. The young entrepreneur makes eco-friendly clothing and accessories as the CEO of Maya's Ideas. "I always loved to find fabrics around the house and say well, this might make a good headband or a good hat or something, and then one day I thought I could probably make a shop," she told My Fox Atlanta. "These are a lot of the fabrics that I might use for my tank tops or my bags, purses, hats." The business has garnered her attention from major business magazines like Forbes. While numbers were not divulged, the tiny entrepreneur contributes 10 percent of her profits to Atlanta-area charities. "I like making people happy through my items, but some people may not have the money to purchase my items, so I try to help other people and make them happy through donating," she said. View the line here and read her blog. Read more at My Fox Atlanta.